It was a very memorable day, and not a standard Wednesday morning. Strapped to a guy’s lap circling above the clouds at 13,000 feet, I felt weirdly calm. I looked out the window and imagined that the white canvas beneath me was merely a sheet of snow covering the ground, obscuring me from the reality of what I was about to do. 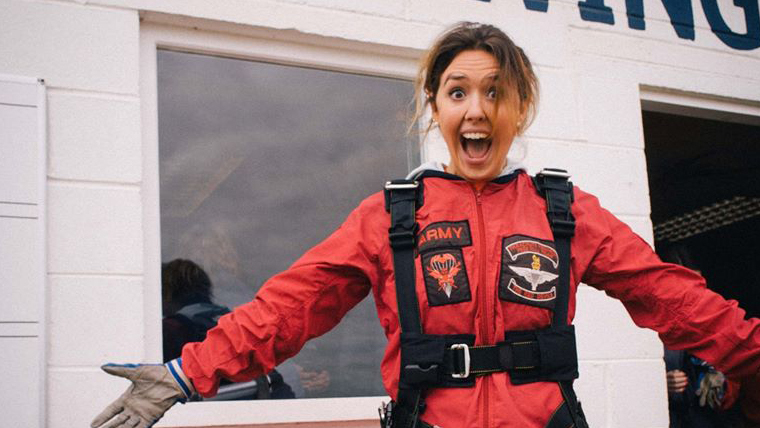 Mentally practising the ‘banana pose’ for jumping out of a plane, I became all too aware I was essentially several seconds from simulating death. It was certainly the least conventional exit I’ve attempted from an aircraft. 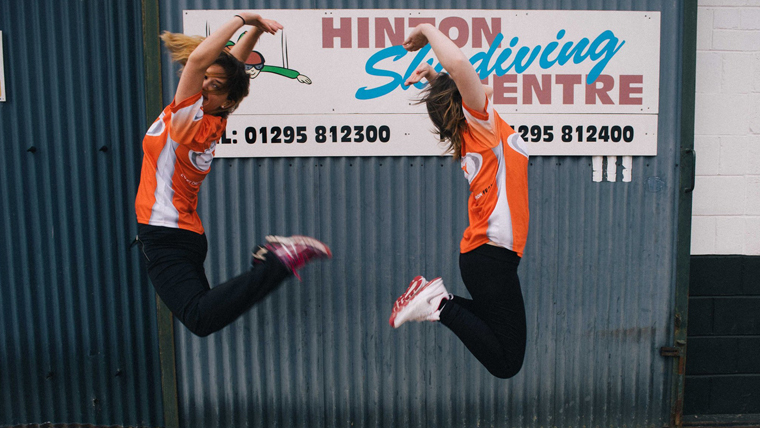 Me (left) practising my banana pose for jumping out of a plane, along with my colleague Michaela. It was several weeks before this that I'd suggested to my colleagues the idea of doing a sky dive for a team fundraiser. It was met with unbridled enthusiasm in the first instance and dozens from across the organisation showed a keen interest. I quickly had my eyes set on a Guinness World record for the most employees from one organisation jumping out of a plane together. In the days following, however, my hopes were dashed. Once the reality set in, the numbers (perhaps unsurprisingly) were dramatically whittled to a stalwart four. 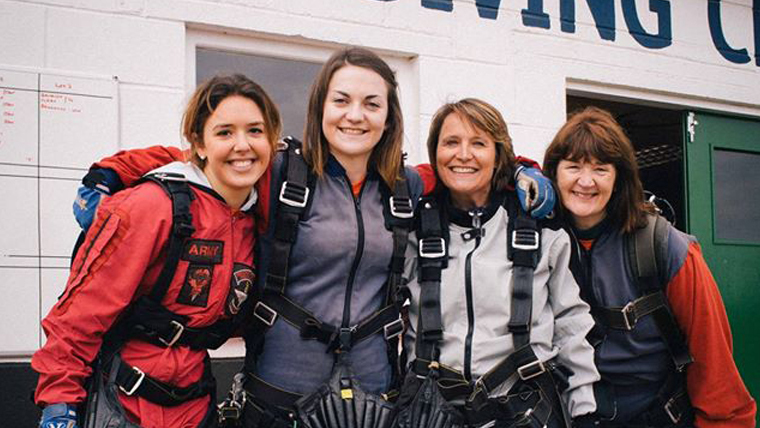 So it was alongside these three wonderful team members: Michaela, Sue and Liz that I decided to take the leap, create a memory and support a very worthwhile cause. We chose for all donations to go to World Vision's South Sudan appeal, because we knew the desperate situation the country had been in for a while, alongside the fact that it wasn't picking up sufficient media coverage to generate enough significant support. Me with my colleagues Michaela, Sue and Liz before the jump. It’s definitely not a day I’m likely to forget any time soon. And can I just add (for the record), you don’t jump out, you fall. Backwards. In fact, you free fall the first several thousand feet for a whole minute and it was like nothing else I've ever experienced. I presumed it would be a prolonged sensation of succumbing to gravity, whereby my stomach would take up temporary residence in my mouth and that I would be relieved when it was over. And it was intense but it was as though I was weightless, falling through the clouds and it was certainly exhilarating. I guess that’s the reason people pay to do it, and some even get hooked. Me feeling relieved and exhilarated after the sky dive. It would be a lie to say that I was entirely without nerves, but a core team of us banded together, united in anticipation and with a sense of adventure. We were so encouraged by the tremendous support we received from the organisation as well as from family and friends. Several people called me a bit of a nutter, but I would consider myself crazy NOT to have done this. I am a typical yes-person who always signs up for the next opportunity. Doing a skydive had been firmly on my bucket list for a while, so when it became possible to get an adrenaline kick as well as unexpectedly raise over £1400 for the forgotten children of South Sudan was a true privilege and a chance not to be missed.